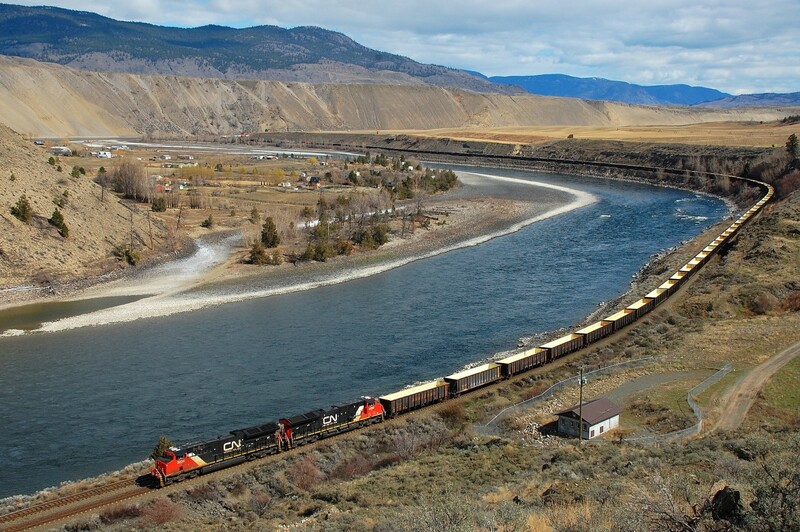 Railpictures.ca - Richard Hart Photo: A pair of Tier4′s are rolling through Walhachin in charge of a mixed freight that includes a string of sulphur cars. | Railpictures.ca – Canadian Railway Photography – photographie ferroviaire Canadienne. Copyright Notice: This image ©Richard Hart all rights reserved. Caption: A pair of Tier4's are rolling through Walhachin in charge of a mixed freight that includes a string of sulphur cars. I never get tired of visiting this area..just ask the wife! My goodness that is a long train. The cars disappear out of sight up river by the big steep bank. People in the little towns must at times be pretty frustrated waiting for these monsters to roll by. Those river valley communities don’t usually have a lot of routes in or out, you’re pretty much stuck waiting.